I've been fighting a weird virus all week. Sniffles and sneezes, an unhappy stomach. Blech. So I was less than excited about getting up for my 6:00AM class. I wanted to take it one more time with Trainer Beau before I started teaching it again next week—I just couldn't do it. 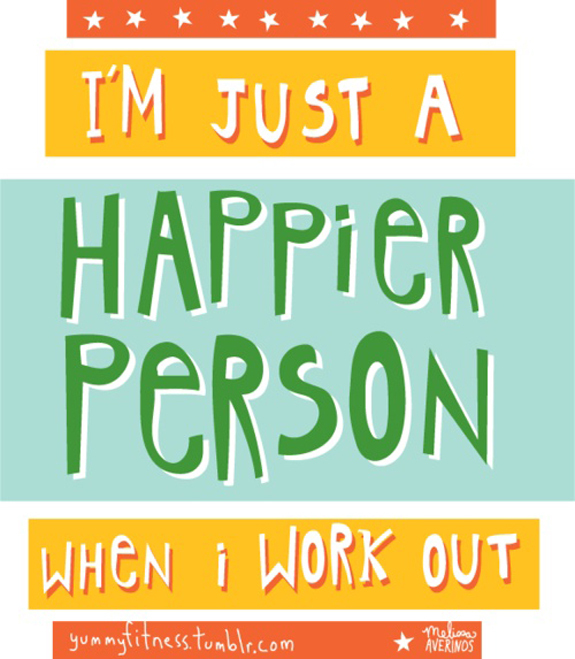 I really am happier after a workout, not to mention the fact that it typically makes me feel better, too. But this funky sickness got the best of me. Sleep sounded like a better option. Plus, this is a big weekend and I need all the energy I've got. Time for little sister's bachelorette party! No, there won't be strippers. C'mon now. Just a big house near Lake Michigan, some wine tasting, a hot tub, plenty of treats...girly stuff. It should be fun. I'm excited and I know she is, too. Nevermind that I'll be the only one there that's both married and a mommy. Don't worry, I'll take pictures. Oh, be careful today—it's Friday the 13th. Gah! Question: Besides working out, what activities make you happy?